Omron Microscan announces demos of exciting new products for incorporating traceability into machine design this coming February 6 – 8 at ATX West 2018 in Anaheim, CA. The latest capabilities of the ultra-compact MicroHAWK family of barcode readers, including the soon-to-be-released MicroHAWK ID-45, as well as the brand-new handheld HS-360X barcode reader, the lightning-fast HAWK MV-4000 smart camera and the multi-array PanelScan® PCB Traceability System will be on display at this immersive exposition on advanced design and manufacturing. With a focus on traceability, at the ATX West 2018 tradeshow, Omron Microscan will showcase several new products that facilitate the integration of track and trace capabilities into industrial automation systems. Omron Microscan will be demonstrating its latest industrial automation solutions at the ATX West 2018 trade show in Anaheim, CA. This immersive event from February 6th through 8th will connect solution-minded manufacturing professionals with experts in automation, electronics, and robotics. 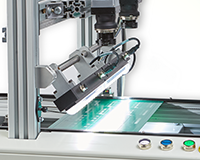 With a focus on traceability, Omron Microscan will showcase several new products that facilitate the integration of track and trace capabilities into industrial automation systems. Traceability is one of Omron Microscan’s key areas of expertise, so visitors should be sure to check out Booth #4395 for insights on how to include traceability in machine design.